Country Estate on over 7 acres-a short 10 minute drive to Naples Pier, 5th Avenue Restaurants and Shopping:Come live in the best of both worlds-convenience and spaciousness. French Country Designed Home consists of 5+ bedrooms, 4-1/2 baths, large office and 2 laundry rooms, den, open concept great room, storage galore -over 5 thousand square ft. New flooring 2 lanais, one with outdoor kitchen and eating areas, and one for relaxing with your morning coffee just off the master suite. These large estates are few and far between this close in. Completely secure and fenced with an electric gate and call button. Three other secure entrances allow access by larger vehicles. 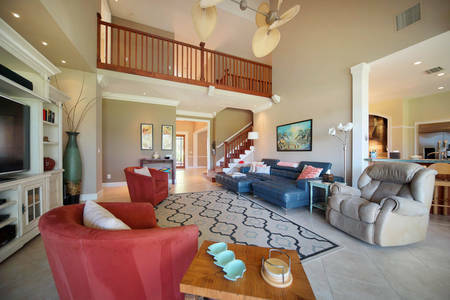 Kids, grand kids, and adults alike will enjoy the large pool and basketball court, and tree house. The property is irrigated and planted with a wide variety of vegetation. It is like living in a park. Pick an mango for breakfast, an avocado for lunch and a lemon for your afternoon garnish. Enjoy the scent of gardenias, jasmine and rosemary as you stroll around your own piece of Paradise. Plenty of room for horses, gardens, chickens, outbuildings, or a guest house, Or several acres can be sold off.